MacSparky released a new book in the Field Guide series today. Presentations by David Sparks focuses on how to plan a presentation that connects with your audience with a focus on using Apple’s Keynote presentation software to get the job done. I picked up my copy today for $9.99 on the iTunes iBook Store. I noticed a couple of older Field Guides were available for $4.99 today. I am not sure if that is a reduced price to celebrate the new release today or not, but you might want to check quickly, just in case. I went ahead and picked up both Email and Markdown from the Field Guide series since the price was so reasonable. I had previously purchased Paperless and wrote a blog post about it titled My Paperless Intitiative – Part 1. You can hear a little more about the Presentations Field Guide directly from David Sparks on Episode 204 of the Mac Power Users podcast. David Sparks also has a post with a trailer video on his MacSparky website. I really enjoy the media rich format of the MacSparky Field Guide Series. Presentations contains over 2 hours of video screencasts and audio interviews, as well as the usual photo galleries, screenshots, and illustrations. Check it out, I bet you’ll like the MacSparky Field Guide series as well. 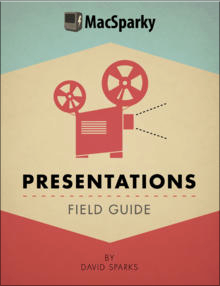 Presentations is available now from the iTunes iBook Store for $9.99.